Nowadays, most people look for short cuts. They see a successful entrepreneur, organization or team and ask, How did you do it? Teach me your strategies. But, these ' quick fixes' that we crave for just to save time and or effort and still achieve the desired results will yield short- term solutions. The author, Covey writes, " the way we see the problem is the problem." He believes that the way we see the world is solely based on our own perceptions. 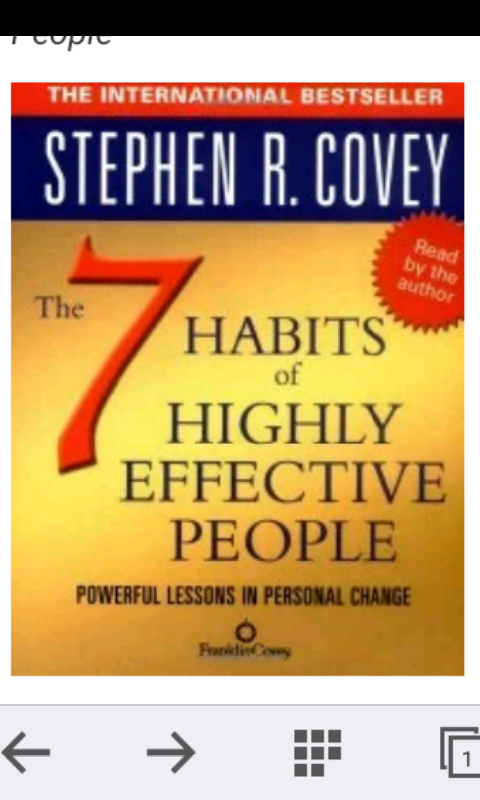 That's where the seven habits of highly effective people comes to play. 1) ' Be proactive': This is what differentiates us as humans from all other animals. It's our inbuilt ability to examine our character, decide how to view situations and control our effectiveness. Simply put, in order to be effective, one must be proactive. People who are reactive take a passive posture- they believe that the world is all over them. These sets of people feel the problem is from the exterior, not interior. But, that feeling or thought is the actual problem. Reactive people are very vulnerable to feeling victimized and out of control. On the other hand, proactive people recognize that they have responsibility ( or response- ability). This( response- ability) is the ability to decide or choose how you will respond to stimulus or situation.
" It is our consent to what happens to us that hurts us far more than what happened to us in the first place." -- Stephen Covey. To be proactive, we need to re- channel our focus on the Circle of influence that is inherent in our Circle of concern. That is, we must work on the things we can do something about. Reactive people focus on things or issues that are in their Circle of concern but not in their Circle of influence. This therefore leads to putting the blame in external factors and causing their Circle of influence to shrink. 2) ' Begin with the end in mind': Start with a clear destination in view. A painter who wants to paint a closet must have planned on how to complete the work without destroying his whole effort. Most of us find it relatively easy to get our hands busy achieving fame, income, promotions etc. But, we do not stop to check the force behind this busyness and behind these victories. We do not pause to sincerely ask ourselves if these things that we get our hands in are what really matters to us. Start with a clear picture of where you are going in mind. That way, you can be sure you are taking steps in the right direction.
'' It's incredibly easy to get caught up in an activity trap, in the busyness of life, to work harder and harder at climbing the ladder of success only to discover that it's leaning against the wrong wall." -- Stephen Covey. Stepping out with the end in mind is very important for businesses. google.com3) ' Put first things first': To effectively manage our time, we need to put first things first. We must be ready to arrange our daily activities based on what is most important( not urgent). In other words, we should discipline ourselves in itemizing our activities according to scale of preference. All activities can be classified into two parts: urgent and important. In order to focus our time on things like building relationships, long-term planning, preparation( all things we need to do), we have to learn how to say "No" to other activities, at times, ones that seem urgent.
" The key is not to prioritize what's on your schedule, but to schedule your priorities." -- Stephen Covey. a) Win-win: Both sides win. The agreement is beneficial and satisfying to both entities. b) Win- lose: These sets of people are very prone to making use of power, personality and connections to get what they want. c) Lose-win: They are very quick to please and seek strength and courage from popularity. d) Lose-lose: Both sides lose. This is the case when two thick headed, egoist and determined people meet. e) Win: People with this idea don't necessarily want the other party to loose. But their concern is that they get what they want. f) Win-win or no deal: If there's no mutual agreement, there's no deal. The best option is to create win-win situation. The win-win or no deal can also be used as a plan B. 5) ' Seek first to understand then to be understood." It is essential that you understand situations and the people around you before you seek to be understood. Make use of compassionate listening to truly understand an individual, then this compels them to reciprocate the listening and take an open mind to being influenced by you. 6) ' Synergize": In this case, you combine the strengths of people via positive teamwork, so as to achieve goals and targets that no one could have singlehandedly done. 7) ' Sharpen the saw': This simply entails balancing and renewing your energy, health and resources to decide a long-term lifestyle.